Our locomotive, Class 37 no. 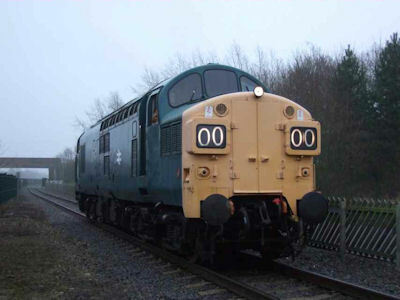 37003, is to leave the Weardale Railway shortly, for an extended visit to the National Railway Museum 's Locomotion Shildon, where it will be one of the main attractions at NRM's Modern Traction event during April 12/13, 2008. The transfer is taking place shortly in order to allow the NRM staff to undertake driver training and for the C37LG members to continue to maintain and restore the locomotive. More details will be announced regarding our plans for 37003 in near future. 37175 leads the first 4 trips 'up the hill' at 1030, 1115, 1200 and 1245 off Bo'Ness, with 025 on rear. 37025 does the last 4 trips 'up the hill' at 1410, 1455, 1540 and 1625 off Bo'Ness, with 175 on rear. Both should work an extra 'shuttle' at 1350 along the foreshore to Kinneil in between too. 37109 successfully started today at 1402 hours, loco then took power at 1443 and has been trundling up and down the quarter mile at Bury all afternoon, no major problems encountered.